Beijing's Qianmen Street, in the center of the capital near Tiananmen Square, has been a bustling commercial thoroughfare for more than 600 years. It's often called Beijing's "First Commercial Street". A reconstruction project aiming to preserve Qianmen Street's history is nearing completion. This is the Beijing's largest wooden archway. Upon passing through the archway at the north end of the Qianmen Street, visitors, technically are on the street. The archway is a faithful reproduction of the original, based on old photos and historical archives. The street is about 840 meters long. Traces of Chinese history are embedded in the grey facades, elaborate wooden archway, the street ornaments of rattle drums and bird cages. The renovation was undertaken in the style of Beijing around 1910's. It wasn't an easy job. The restoration plan was revised 32 times. Yi Xiangliu, member of Qianmen St. Reconstruction Committee, said, "The new street will be a combination of old and new. We are keeping the street's original style and adding some modern style. This reconstruction project is a valuable experience for us." The renovation places the once obsolete street car back on the rails. 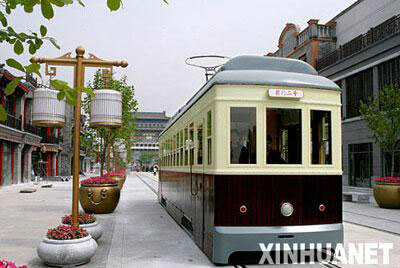 The two street cars currently on test runs are designed and built according to the original style - imported to Beijing in 1924. Cockpits are installed at both the head and the tail of the car. Each car has a seating capacity of 84. The street cars have brand new charging systems. Two minutes will charge the motor enough for a return trip.